Report from the Atlanta General Defense Committee of the IWW on the recent sick-out strike by school bus drivers. 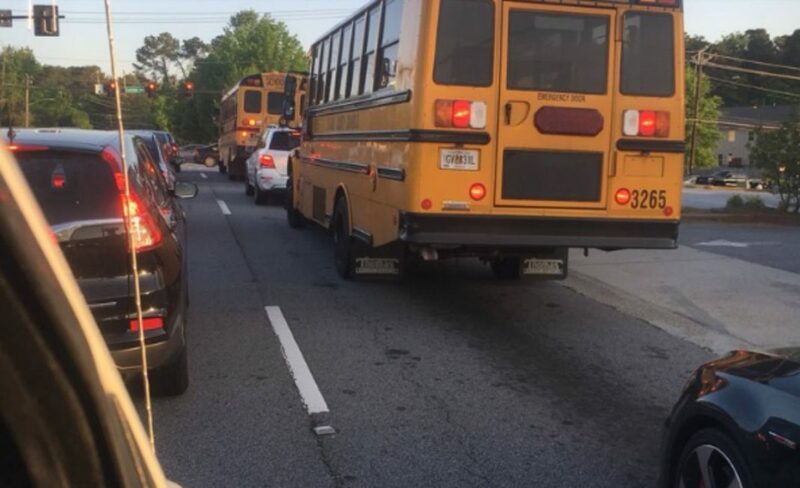 School bus drivers in DeKalb County, GA (part of Metro Atlanta) have begun a three-day sickout as of today, April 19th. The sickout is off to a strong start, with almost 400 drivers not reporting for work. With this action, they are picking up the torch that was lit by teachers and school bus drivers in West Virginia, and has been carried by education workers striking and and waging sickouts in Jersey City, Puerto Rico, Oklahoma, and Arizona. They are also following the successful example of MARTA Mobility (paratransit) drivers in Atlanta, who held the first ever one-day strike in the MARTA system on February 14th and threatened another one for April 18, pressuring management to cave to their demands at the eleventh hour. The important issues facing the DeKalb County bus drivers are those of pay, retirement, respect, and recognition. DeKalb County school bus drivers are among the lowest paid in the state, with exorbitant health care costs, and have not received a pay increase since 2010. Along with other bus drivers across the state, they have no retirement plans – when a driver retires after 45 years, other drivers take up a collection to see them off. Drivers also complain of a severe lack of respect or support from administrators. Drivers, mechanics, and other workers have been organizing to demand change for years, but these issues have not been adequately addressed by the DeKalb County School Board, even when multiple drivers and mechanics have consistently turned up to school board meetings for years to express the need for change. Through their sickout, the drivers are withdrawing their labor in an attempt to push the school board to negotiate. All workers have the right to refuse to work, yet the school board refuses to acknowledge their concerted activity and are engaging in threats, intimidation, and disinformation, even claiming that the organizers have called the sickout off, and threatening retribution against those who have participated in the strike. Bus drivers in DeKalb are doing a sickout for the next three days and the school board is threatening to fire them? Why not… listen to their demands? Because you’re clearly not? Green’s response to bus drivers, who keep kids safe everyday, is disgusting. The Atlanta IWW and GDC are supporting the struggle of the drivers to push the School Board to do the right thing. Their struggle is an example for workers and communities all across Atlanta – a victory at DeKalb County will light the path for education workers and transportation workers across Georgia to fight and win!